A balanced audio cable is a type of cable that helps to reduce electromagnetic interference, or noise, from your signal. This noise can take the form of humming or loud clicks when electrical equipment nearby is operating or being turned on or off. A regular cable would carry a signal over 2 wires. These would normally be the signal and ground wires. With a balanced audio cable there are 3 wires; The ‘Hot Signal’ , the ‘Cold Signal’ and the Ground. The hot and cold signals are exact opposites of each other. The waveforms are completely out of phase and if the waveform goes up on the hot signal it goes down on the cold signal (See the diagram below). 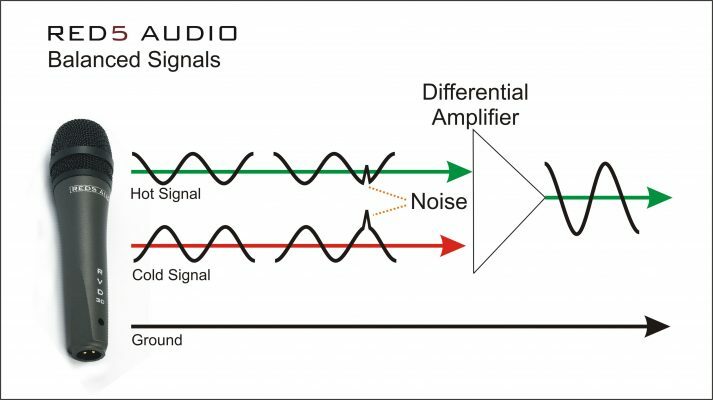 When the signal reaches the equipment at the other end a ‘differential amplifier’ combines the signals and creates a single output again. If any external interference is introduced to the balanced cable it will not be out of phase and will be the same on both wires (See the 2 peaks called ‘noise’ on the diagram). Because this is the only part of the signal that is in phase the differential amplifier is able to cancel these singles out leaving only the original clean signal. As you need 3 wires for a balanced cable you can use the popular ¼ mono jack for this purpose as it only has 2 wires in it. The most common way to make a balanced connection is by using a cable with XLR connectors at each end as they have 3 connectors as standard.